Ball winders and even swifts are new-fangled thingies I don’t possess. When I need to wind a center-pull ball of yarn, I do it the old fashioned way: By looping the yarn around a niddy noddy or a handy piece of furniture and winding it onto a nostepinne. I have a nice cherry-wood nostepinne that works quite well. I can usually wind a 150-yd skein of yarn on to it in about 30 minutes or so. Recently I received a hank of lace-weight merino. 1350 yards of lace-weight merino. I figured I should be able to wind it into a ball in nothing flat. Right? I found a handy piece of furniture that was the right size to loop the hank around and started winding. And winding. And winding. For some reason it hadn’t occurred to me that if 150 yards takes 30 minutes, 1350 yards, or 9 times the first amount, might take a bit longer. Maybe 9 times longer. That would be… 4-1/2 hours. I can’t stop in the middle because of the previously mentioned use of handy pieces of furniture. My house comes complete with a yarn-devouring cat. Yarn left looped around a handy piece of furniture would be seen as fair game. Moo Cow can slice through super-chunky weight in one bite. And this was lace weight. Very fine, fragile, lace weight. So, stopping only when absolutely necessary, I wound and wound and wound and wound, and then I wound some more. I wound until my shoulder and my neck cramped, and then I wound some more. I did stop to talk to my cousin on the phone for a bit, but I guarded the yarn while doing so. And then I wound more. You can see from the first picture that I was, finally, successful. 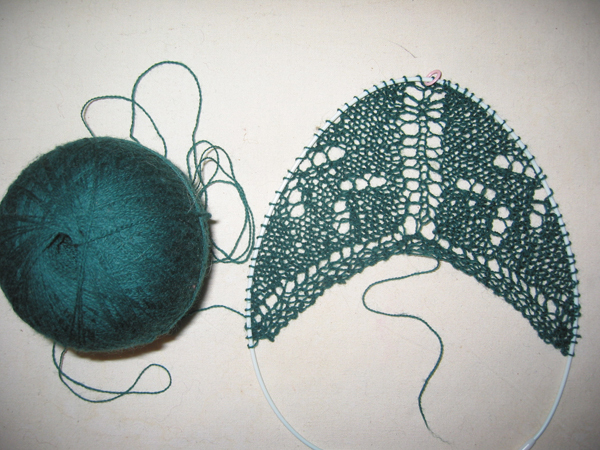 This is the start of the Pacific Northwest Shawl. I’ve finished the first seagull chart and I’m ready to begin the second seagull chart. I’m really having fun with this lace. I can’t wait to get to the pine trees. I’m knitting it on sz US#6 Bryspun Bry-flex needles. What I like about these needles: The very flexible cord (even more flexible than Addi’s) that doesn’t pull the lace out of shape (you can see this in the pic), the lightness, the speed at which yarn slides on them. What I don’t like: The tips could be pointier, but they’re OK. The step at the join catches the stitches. I haven’t neglected the Tilt sweater. This picture shows some of the progress I’ve made. I love the way the colors in the Noro Silk Garden are knitting up. Not shown in this pic is an orange color. The buttons are from Button Emporium downtown. They’re hard to photograph well, but you can see the swirly stuff in the center. The colors are relatively right-on, but what doesn’t show is that it’s actually chatoyant. Five buttons are for the sweater, the sixth is “just in case” because the buttons are no longer being made. 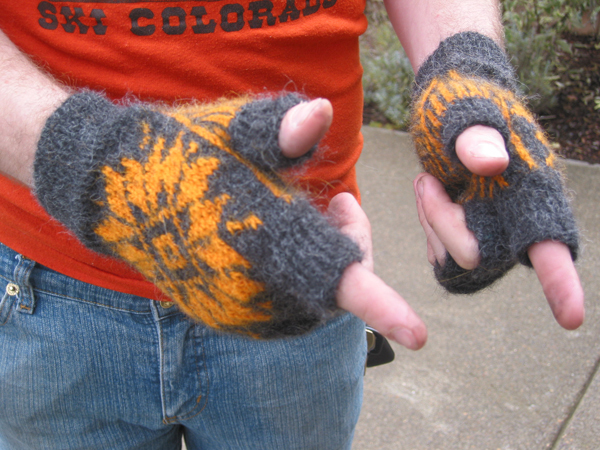 And, finally, the fair-isle fingerless gloves for #1 Son are complete. Click on the link for the whole story on those, and to read how he almost gave me a heart attack when the gloves were about 3/4 finished.